A lot of buzz has been surrounding the Best of Best KPOP Concert since the teasers came out, with fans eagerly guessing which of their favorite Korean boy bands or girl groups will be coming to perform. Excitement heightened following the announcement that seasoned groups, namely Super Junior and Girls Generation , will be heading to our shores, along with the much-anticipated rookies, Red Velvet – plus one mysterious guest. Now, fans have a lot more to look forward to as the secret guest is revealed to be none other than BTOB (Born to Beat) , the seven boys from Cube Entertainment that is stealing hearts from all over the world. They will join the three international KPOP stars live on April 12, 2015, at the country’s biggest concert venue, the Philippine Arena. Talent, good looks, and a friendly and approachable charm – the seven boys of BTOB have all these and more as they are rapidly shoot to stardom. Hailing from the same company as the phenomenal groups 4minute and B2ST, BTOB is equally as formidable with a unique color of their own. With chart-topping hits including Insane, Imagine, Wow, I only know love, among others, the boys have garnered loyal fans in Singapore, Indonesia, Japan, Taiwan, and of course, South Korea. Some members of the boys have appeared in highly successful dramas and TV shows, namely, TVN’s Plus Nine Boys, SNL Korea, and even some cameos in The Heirs. Tickets to the show will be available in store and online starting March 6 at TicketWorld, and priced at PhP 9,500 for VIP, PhP 8,000 for Lower Box A, PhP 6,500 for Lower Box B, PhP 4,000 for Upper Box A, PhP 2,500 for Upper Box B, and PhP 950 for General Admission. Booking fees not included. Shuttle express to and from the Philippine Arena will be available for concert attendees and could also be booked thru TicketWorld. 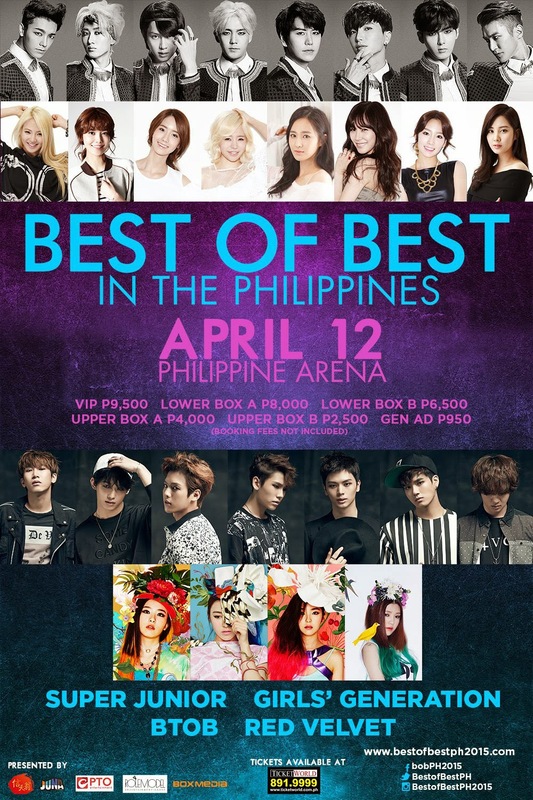 Come experience this amazing, once-in-a-lifetime KPOP lineup and cheer for your idols! For more information about the concert, check out the event’s official social networking sites by liking the Facebook page Best of Best KPOP Concert PH; and follow @bestofbestph2015 on Instagram and @bestofbestph on Twitter. Join the social conversation #bestofbestkpop.